At Best&Less the safety of our customers comes first. 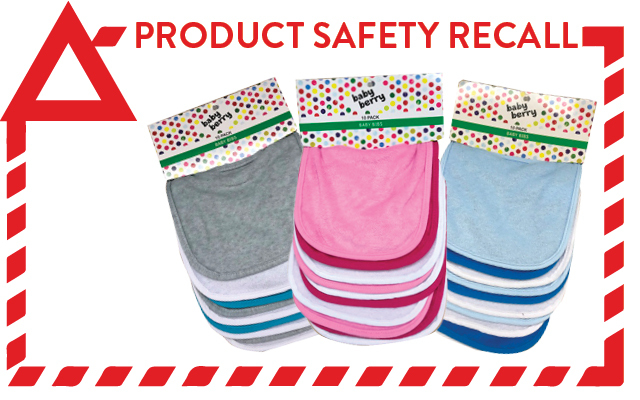 Therefore to avoid the risk of any possible harm, we are recalling the Baby Berry Bibs 10 pack sold in-store & online in the last 12 months. The satin looped care label may not be secure on some bibs sold in the last 12 months. If the care label were to tear off it could be a choking hazard for a baby. Customers should check that the care labels are securely sewn onto the bibs and either cut out the care labels with scissors or return the bibs to a Best&Less store for a full refund or exchange. See productsafety.gov.au for Australia product recall information.